10 miles south of Jericho, Qumran was on a “dead-end street” and provided a perfect location for the isolationist sect of the Essenes to live. The site was excavated by Catholic priest Roland deVaux from 1953-56. More recent excavations of the site have taken place under the direction of Hanan Eshel. Requiring vast amounts of water for their daily purification rites, the Essenes had to channel the water from the wadi during the infrequent winter storms. This dam helped to divert the water into an aqueduct which led to the site which in turn had dozens of cisterns, mikvot and pools. On the basis of inkwells and “writing benches” found in this room, archaeologists have suggested that the second story room of this building was the place where scrolls were copied. No scrolls were found in this room or in the ruins of the site itself. But the same type of unique pottery was found both on site and in the caves with the scrolls, helping to connect the two. This long room was used for communal meals. Three rows of tables were apparently in place where the Qumranites ate in silence. In the next room over, more than 1000 complete vessels were found including 708 cups, 210 plates and 108 salad bowls. All of these were serving vessels as they were never fired. Numerous mikvot (ritual purity baths) were in use at the site for this community that practiced immersion twice daily. 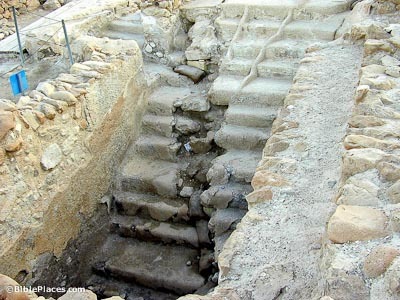 This mikvah evidences the site’s destruction by earthquake in 31 BC. The crack shifted the left side of the mikvah by nearly 12 inches. 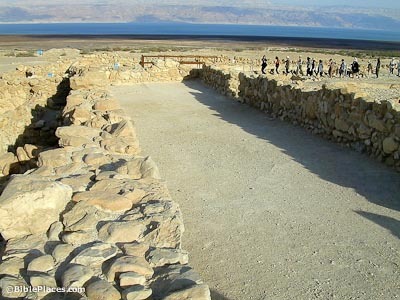 Of 1,200 tombs found in the cemeteries of Qumran, nearly 50 have been excavated. The main cemetery has 1,100 burials, the northern cemetery 30 and the southern cemetery 30. The presence of female burials in what has been regarded as a celibate male community has been a mystery. 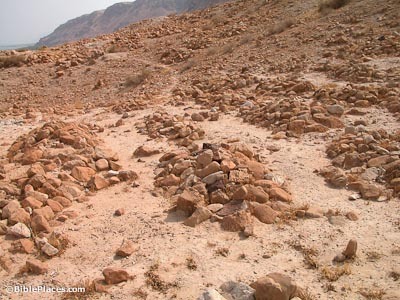 Recently Joe Zias determined that the female burials were more recent interments of Bedouin. 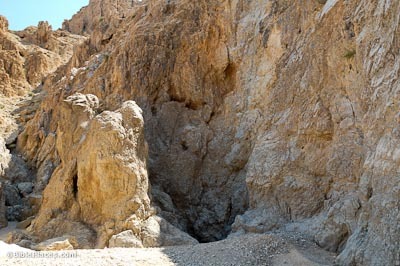 See Qumran Caves at BiblePlaces.com for a tour of the places the scrolls were discovered. See also the related sites of the Dead Sea, En Gedi, Masada, Jericho, and the Judean Wilderness. Scrolls from the Dead Sea (Library of Congress) The site for the Library of Congress Exhibition from which the Qumran Library stems. Artifacts from the Qumran Site (Library of Congress) Excellent description and photos of archaeological discoveries at Qumran. Shrine of the Book (Israel Museum, Jerusalem) A brief but informative explanation of the scrolls including a section on their restoration. 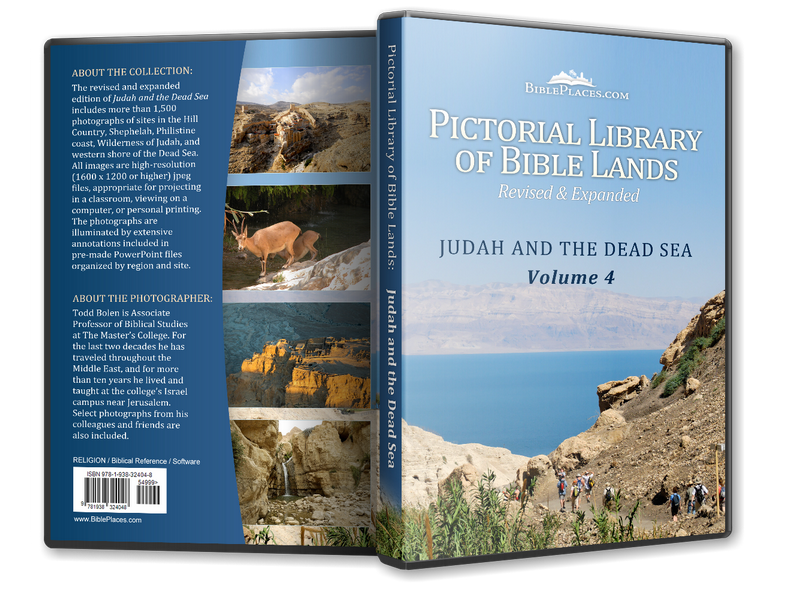 Qumran (The Israeli Mosaic) Contains informative sections on the ruins of Qumran, the Dead Sea Scrolls, the Dead Sea sect, and getting there. Links throughout allow for in-depth study. Qumran (Into His Own) A brief, encyclopedia-type article with multiple links to related words and topics for further study. Qumran: A Day in the Life (The Foundation for Biblical Archaeology) A fictional story, written about a man whose name was actually mentioned in one of the scrolls, based on details of daily life taken from the scrolls and other relevant sources. 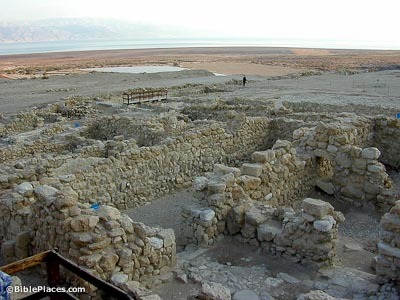 Qumran (Donald D. Binder, SMU) An article focusing on the dwellings of the community at Qumran. Qumran Library (ibiblio) Photos, descriptions, and translations for various scroll fragments, including Psalms, phylactery, Community Rule, Calendrical Document, Enoch, Hosea Commentary, Leviticus, Songs of the Sabbath Sacrifice, Damascus Document, and War Rule. 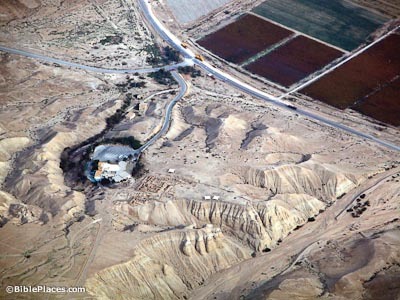 The Essenes and the Dead Sea Scrolls at Qumran (Goodnews Christian Ministry) A lengthy article dedicated primarily to the identity of the Essenes. Qumran Science (Hebrew University) Numerous scientific reports by Dr. Jan Gunneweg to determine date and identity of the inhabitants of the site and the caves. Some material is unavailable online until it is published.